Earlier this year, Amir Khan had two big offers on the table. On one end, a lucrative domestic showdown against longtime rival Kell Brook. On the other end, a ESPN Pay-Per-View fight with WBO welterweight champion Terence Crawford. The Crawford fight was also lucrative, but not as lucrative as the bout against Brook. 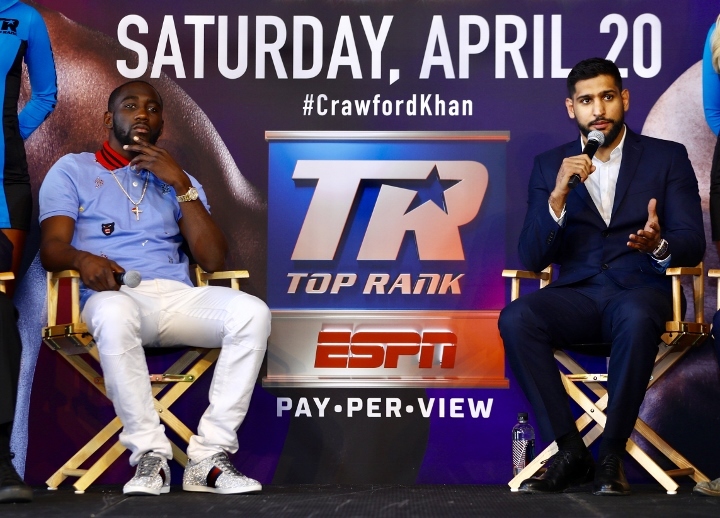 Khan made his decision to go with Crawford - who the British star views as more of a legacy fight with Crawford's status as being one of the top pound-for-pound fighters in the world. The bout between Khan and Crawford will take place on Saturday night, at Madison Square Garden in New York City. While he believes his career profile will get much bigger by beating Crawford, Khan also feels more comfortable with the fight. Khan claims that Crawford's style is going to be easier to deal with than Brook. “I had another fight in the UK against Kell Brook, but this fight is stylistically better for me,” Khan said to The Mirror. “Obviously, this is with ESPN, who I want to thank as well. I think that being on ESPN, the fight will be even bigger. It will be good for my recognition for me as well in the future. “I don’t know if that fight is still going to be there. I have seen numerous times in the media that Eddie (Hearn) is saying that the Brook fight is dead. He’s saying it’s not going to happen. Time will tell, I take it fight by fight. Let’s get this fight out of the way first and then we take it from there. That fight may never happen, but it may happen, so I just take it one fight at a time, as it comes really. “We’ve both been hurt but I’m a fully-fledged welterweight who hits hard. I’m am unbeaten welterweight fighter and it’s the weight I feel comfortable at and that I feel strong at. I’ve got the perfect size whereas the other weights might have been too much for me, like when I fought Canelo [Alvarez]. Brook vs Kahn is s fight that will always make money cause of the uk rivalry. Kahn can get stopped by Crawford and still get a massive payday against brook. Khan picked Crawford because he is still a question mark. Khan knows Brook is a more polished and reputable opponent. With this being said......He'll get destroyed by Crawford too. [QUOTE=T.M.T;19662133]He never wanted to fight Brook and never will. [/QUOTE] I think he will as his final pay check before retiring.